Selective cat breeding is what cat breeding is all about. So what is it? This is an outline discussion. It is slightly controversial in keeping with my slightly rebellious nature. Before I continue I would like to say that I am not against cat breeding. But I am for high levels of responsibility in breeding cats – focusing on the health and contentment of the cat, foremost, and not the profit. This can be the only way as breeders are creating sentient beings that feel and have emotions at a time when there are millions of cats in rescue centers in need of a good home. Selective cat breeding refers to arranging and managing the breeding of selected cats, nearly always purebred cats, that possess certain desirable characteristics, the most important of which is probably appearance. Other selection criteria are character and health. The debate, as inferred above, is whether there should be more emphasis on selective breeding for health foremost, character second and appearance third in that order of importance. At present it could be argued that the criteria is in the reverse order. The breeding program is largely consumer led and people like interesting looking cats. Of course in selecting cats with desired traits the breeder is deliberately eliminating cats with undesirable traits the most obvious of which are inherited genetic health problems. This is a positive aspect of the process but how many breeders do this? And were these often recessive traits brought to the surface in the first place by selective breeding? Cat breeding is not the opposite of natural selection but it does ride roughshod over the process of natural selection as expounded by Charles Darwin in his seminal work, On the Origin of Species, published on 24 November 1859. Selective breeding is instant, immediate and the breeder plays god in a sense. However, God did not create the universe or mankind, it has been decided by Britain’s greatest living scientist1. The idea behind selective breeding was that we, as humans, believed shortly after the time of publication of Darwin’s work that we could improve on nature’s natural and slow process. It is a reflection of humankind’s arrogance. This is entirely my point of view of course. It is worth reminding ourselves that all the cat breeds are a single species of domestic cat, scientific name felis silvestrus catus. The wildcat species (36) have evolved over eons through natural selection. Their characteristics have evolved to allow individual species to benefit from the habitat that the cat lives in to aid survival. The selective breeding of domestic cats is not about maximizing the chance of survival; it is largely about the appearance of the cat. Indeed, it has been said that selective breeding of cats diminishes the chances of survival as ultimately it shortens lifespan due to the increased likelihood of inheriting genetic diseases2. The breeds have to be sufficiently well delineated otherwise a breed cannot be a breed. This is achieved through selective breeding. And within the breeds the appearance is refined and the types of coats and colours expanded. Selective breeding also takes place in respect of captive wild cats. White tigers are popular and so are selectively bred. Here is an example of an overlap in terms of objective between domestic and wildcat. Breeding white tigers selectively is problematic due to an unacceptably small initial gene pool, which results in genetic defects being thrown up. The public is rarely aware of this. Selective breeding began comparatively recently in the late 19th century, the start of the cat fancy. The first cat show was at Crystal Palace in London in 1871. Selective breeding of domestic cats is largely a western thing, bound up with purebred cats, the cat fancy and cat shows etc.. In most parts of the world cats are cats. What you see is what you get and no one tries to alter that – it’s all natural. Selective cat breeding seeks to alter the appearance, to refine it and improve it. It could be argued that it is the converse of natural, i.e. unnatural. But that is not quite true as selective breeding can follow what happens naturally but it rarely does. Does it work? I’ll let you decide. A classic example of selective breeding is the creation of higher contrast mackerel tabby cat strips. The wildcat is a tabby cat but the natural camouflage of the coat is too functional for the domestic market where people’s preferences tend towards more interesting and arresting appearances. 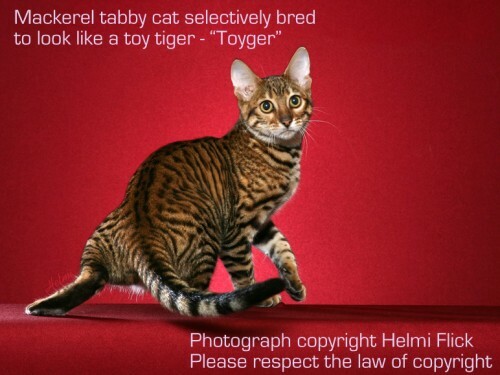 The Toyger is an example of a tabby cat made to look like a “toy tiger” through breeding selectively to a predetermined blueprint. Finally, selective cat breeders will take a naturally occurring mutation, say the curly, crinkly coated cats (the rex cats) and refine and shape a single rare mutated cat into a cat breed. An example is the Devon Rex. There others. The Devon Rex cat should really look like a random bred cat with a curly coat but through selective breeding it is also made to look elfin like. Despite my slight criticism of overzealous selective cat breeding (the flat faced Persian is the worst example), cat breeders have produced some wonderful cats and given countless millions of people a great deal of pleasure in being the human caretaker of a stupendous looking purebred cat. 1. Times Newspaper dated 2nd Septembet 2010. “Hawking: God did not create the Universe. 2. Cat Watching by Dr. Desmond Morris. This entry was posted in Cat Breeding and tagged cat breeding, Selective Cat Breeding by Michael Broad. Bookmark the permalink. M’kay, I did not get very far in to the article, because when I clicked on the link in mu email, it took me to the bottom of this page… So, I’m the second/third one to comment. Mr. Althouse, may I ask, how did you hit upon this page? Secondly, are you finding issue with the single photo that was displayed? (Many of us do single-mindedly–find an image to be more “tangible” than the words on the page. I find, more often than not, that I need to focus on the words, rather than the image, being a visual type person. This is really retarded you don’t have any other types of cats that are selectivly bred!!!!!!!!!!!!!!!!!!!!!!!!!!!!!!!!!!!!!!!!!!!!!!!!!!!!!!!!!!!!!!!!!!!!!! Please explain yourself – calmly.